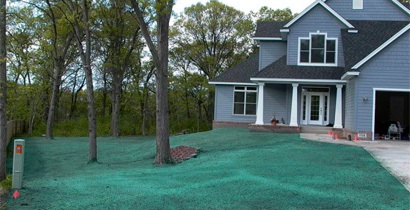 With our state of the art Hydroseeding equipment, Ada Tree Service can install seed, starter fertilizer and hydromulch in a single step application – creating the perfect environment to establish a lush, green lawn in as little as 30-45 days. Our single step hydroseed application is designed to establish turf faster than traditional dry seeding and at a fraction of the cost and time of installing sod. Ada Tree Service offers hydroseeding for installing new lawns, repairing damaged area’s within an existing lawn & golf courses, overseeding, roadside revegetation, wetland planting, erosion control and slope stabilization with “spray-able” erosion control blankets. As well to add a bit of color with wildflowers!